To Tea Or Not – Black, Green Or Milk? Christmas is in the air again! We have already reviewed the water footprints of other festive and enticing foods and drinks in the past, from delightful chocolates to addictive crisps, and from malty beer to fiery Moutai. This year, we have picked a less guilty and healthier item to review – tea, which is (arguably) the second-most widely consumed beverage after water. Globally 25,000 cups of tea are consumed every second—about 2.2bn cups per day. 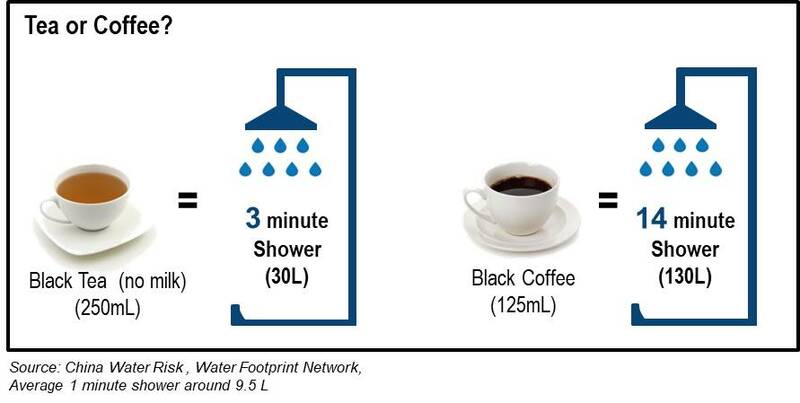 The Water Footprint Network estimates that the entire production chain of a standard cup of tea (250mL) with 3g of black tea requires 30L of water. In other words, a cup of tea requires 120 equal-sized cups of water. That’s equivalent to the volume of water needed for a 3-minute shower. However, there is some good news for tea drinkers – although tea production requires a lot of water, it is less ‘thirsty’ than coffee. A standard cup of coffee (which is smaller than a cup of tea – half the size), using 7g of roasted coffee grounds, takes 130L to produce. This means that the water footprint of tea is only one fifth that of coffee. Furthermore, compared to coffee, only a small quantity of ‘green water’ (rainwater) is required to grow the tea. 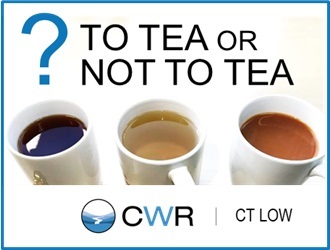 Tea also produces just half of coffee’s ‘grey water’ (wastewater) footprint, producing only 2L. This is because tea is relatively simple to process after harvesting, unlike coffee, which requires water-intensive processing. Given that a standard cup of coffee is only half the size of a standard cup of tea, if we compare an equal volume of coffee to tea, the water footprint of a cup of 250mL coffee doubles to a total of 260L! So the next time you crave caffeine or need an energy boost, you may consider swapping that cup of Joe for a crisp mug of pu’er. Black, green or milk – does it make a difference? If Darjeeling (black) is not your cup of tea, how about Long Jing (green) or earl grey? A study shows that the water footprint of a 1.5g tea bag, from the tea leaf production up to the manufacturer’s gate, for black tea is 19.8L, while for green tea it is 18.46L, and the average for flavoured tea is around 13-27L per tea bag. Packing materials account only 6.4% of the total water footprint. The remaining of 93.6% goes to the ingredients, including raw tea and flavourings. From the water perspective, you probably don’t need to fret over which tea to choose, or whether to go for loose or bagged tea; there is not much difference among these. But this is not the whole story; bagged tea has, in fact, ten times the carbon footprint of loose tea. If you are a heavy tea drinker, choosing loose tea over bagged tea is an easy way to reduce both your water- and carbon footprints. Global tea consumption continues to rise…do we have enough water? In terms of global consumption, tea has seen an annual increase of 4.5% from 2007 to 2016, for a total of 5.5mn tonnes. This increase has been underpinned by the rapid growth in per capita income levels, notably in China, India and other developing and emerging economies. Tea consumption has grown particularly rapidly in China at an annual rate of 10.1% over the decade, reaching 2.1mn tonnes in 2016, or 38.6% of global tea consumption. China is currently the world’s top producer of tea, accounting for 42.6% of global production or 2.44mn tonnes in 2016. Since an average of 30L water is used for making a cup of tea, it can be extrapolated that China’s tea production consumed at least 24.4trn L of water in 2016, which is equivalent to the volume of water needed to fill the High Island Reservoir in Hong Kong 87 times over! Given the water scarcity problem in some regions of China, do we have enough water to ensure a sustainable future for tea? The recent report ‘Creating a Sustainable Food Future‘ released by WRI can shed some light on this issue, by offering a five-course menu of solutions to ensure food sustainability without increasing emissions and placing additional burdens on future generations. Although China leads the world in tea production, the Chinese are not the top consumers of tea as measured by per capita consumption. This distinction goes to the Turkish, who consume an average of 3.2kg of tea per person every year. Although China is by far the driving force of global tea output, the country only ranked 19th in per capita consumption with 0.6kg, which is 82% below that of Turkey. Hong Kong is ranked slightly higher than China at 17th, with per capita consumption of 0.7kg. Let’s take it up a notch and look at a popular tea beverage found in Cha chaan teng, Hong Kong’s iconic ‘tea restaurants’. A cup of 250mL HK-style milk tea (62.5g evaporated milk and 12.5g tea) requires a whopping of 243L of water, which is the equivalent of 26-minute shower. Perhaps unsurprisingly, nearly half of the water footprint in the HK-style milk tea is attributable to the milk. Another popular tea beverage, Yuenyueng (50g evaporated milk, 2.5g coffee, and 10g tea), also has a water footprint of 241L. If you want something less ‘thirsty’ and more refreshing in the restaurant, consider going for a dairy-free drink like lemon tea, which has a much low water footprint of just 69L. Similar to the challenges faced by coffee producers, in recent years, the issue of climate change has come to a boil for the tea industry. According to a survey by ‘Tea for Business’, climate change has turned up as the No.1 concern for tea growers. Tea plants are highly sensitive to changes in growing conditions and can be grown only in a very limited number of countries, many of which are exposed to the climate change risks, such as floods, droughts and fluctuating rainfalls. These factors are not only affecting the yield, but also the taste and quality of tea. A study found that wetter monsoon conditions could lead to a 50% decrease in the compounds that give Yunnan teas their distinct flavour. As a result, the teas have a gentler taste and aroma. Nuances in quality may not matter as much in staple crops like rice or wheat, but when it comes to tea, small differences in quality play a major role in determining tea’s market price. As the impacts of climate change are expected to intensify, the Food and Agriculture Organization of the United Nations (FAO) urges tea-producing countries to integrate climate change challenges, both on the adaptation and mitigation fronts, into their national tea development strategies. We have seen that coffee and beer are now struggling with climate change; will tea also suffer? More importantly, will we still be able to enjoy a nice cuppa in the next 20 years? While we cannot yet read the tea leaves on this, we can make smarter choices by picking the right tea to drink. Low has extensive inter-disciplinary research experience, which although wide-ranging, focuses on identifying hotspots to facilitate better planning. At CWR, Low uses spatial modelling and statistical analysis as well as remote sensing, cartography, and geo-statistics to map and assess water risks. In addition, he helps manage CWR’s extensive network of contributors and partners. CWR is Low’s first foray outside academia and he hopes to apply his 12 years of scientific know-how toward enhancing the understanding of water risk in Asia, including spatial temporal variabilities of anthropogenic and natural factors on water resources. Previously, Low was a postdoctoral fellow at the University of Hong Kong where he devised methodologies to measure and benchmark the quality of urban life in an Asian context. As a certified GIS Professional, he also taught GIS and spatial analysis modules there. Low’s research on urban, human and environmental health is published in 11 prominent international peer-reviewed journals; he has also written a chapter in a book on managing environmental hazards. His PhD thesis on place effect on human well-being was prize-winning. Low is currently the reviewer editor for the journal “Frontiers in Environmental Informatics” and also reviews other international journals such as “Applied Geography”.